Rocketeers, the brainchild of two alumni of the Indian Institute of Space Technology, has launched model rockets which fly at up to 900 feet. Bengaluru: Students and rocket enthusiasts across India have had a reason to rejoice since 1 January 2019, when space start-up Rocketeers launched the first commercially-available model rockets in India. Rocketeers’ models are capable of flying between 300 to 900 feet in open, safe areas, and can even carry payloads. Model rockets are usually small, light (most weigh under a kilogram), made entirely with non-metallic components, and are typically solid-fuel powered. The fuel is normally black powder and ammonium perchlorate composite propellant. They are known to reach anywhere between 300 feet and 3,500 feet. And they are are extremely affordable — Rocketeers’ most expensive rocket, including fuel, costs Rs 3,000. Rockets that either reach a greater height or weigh more than 1 kg tend to be classified under the next rung of rocketry, called ‘amateur rockets’. This is followed by ‘sub-orbital sounding rockets’ that fly up into space but do not make a full orbit of the earth, and finally, the familiar ‘regular orbital rockets’. Of course, model rockets are not disposable. After launch, they come back down to earth and need to be recovered. The standard method to recover the rockets — which Rocketeers also offers — is through a parachute. But there are other options as well, and one among those is the SpaceX-style recovery of the first stage of the rocket by steering it back to the ground perfectly. The idea for Rocketeers took shape in 2010, and non-commercial work under the label has been going on ever since. The group has been conducting model rocket-building workshops all these years, before applying for a commercial licence towards the end of 2016. The company was co-founded by Divyanshu Poddar and Akash Ekka, alumni of the Indian Institute of Space Technology (IIST), Thiruvananthapuram. Today, it has 15 employees, and offices in Ludhiana (warehousing and manufacturing), Delhi (marketing and regulations), Bengaluru (technical and design), and Sivakasi (fuel). “Model rockets are super affordable. If US can float 14 to 16 million rockets a year, India easily has a market of over 50 million. I want to see kids fly model rockets everywhere because I was that kid that really wanted to fly one and couldn’t,” says Poddar. Rocketeers currently has five different model rockets. The biggest one can even carry a payload using three fuel cartridges. To compare, the biggest Diwali firework rocket can carry 16g of fuel and has 32g weight at ground, reaching a height of 270 feet. Rocketeers’ smallest rocket carries 7g of fuel, weighs 35g without fuel, and goes to 350 feet. The fuel casing as well as the body of the rocket is made of Sack-Kraft paper — used in premium paper bags and difficult to tear under pressure — which is rolled into tubes using polymeric resin. The nose cones are made with high density plastic. The fins and payload housings inside the rocket are made of balsa wood, and the parachute is made of thin polythene sheets. Strings in the parachute and rocket are made out of polyester resin, while PVC foam rings adjust fuel cartridges inside. The fuel is same as that used in fireworks: Carbon, potassium nitrate, and sulphur. But how it is manufactured and filled into cartridges is unique. Poddar also says Rocketeers has pioneered the standard practices for model rocketry (such as a three-step redundant system to prevent accidental firing of rockets) to enable safety in the ecosystem. It also prevents wastage: The rocket assembly instructions sheet itself is actually fused as an A1-sized space themed poster. 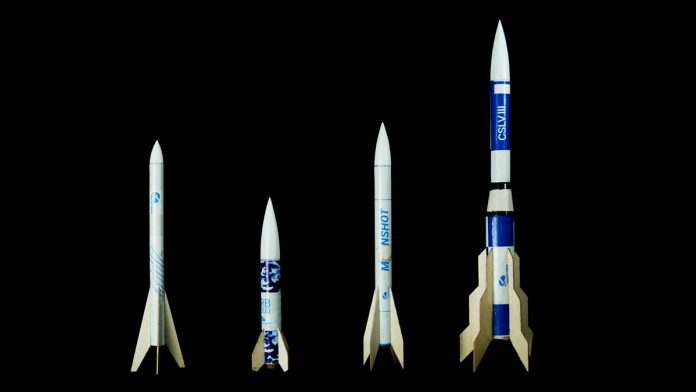 The commercialisation of model rockets has been historically difficult in India, with at least 14 companies having attempted it in the past. Even Rocketeers wasn’t able to sell them. Instead, Rocketeers’ product was the workshops it conducted across the country, teaching citizens and students how to build their own model rockets. “We have been getting 13 to 14 emails a day, consistently, from students who share stories about burning down their garage or getting third degree burns. And this was before we even had a solid online presence,” says Poddar. So, why was it difficult to commercialise? “That is the billion dollar question,” laughs Poddar. Regulation must entail restrictions on how a model rocket can fly and where. Drones, for example, are allowed to fly without a unique identification number if they are under 2 kg and fly below 60m. Model rockets don’t have any such restrictions at all. There is simply nothing that controls the way model rockets fly. “The one thing we ensured was that all levels of the government knew that we are a company called Rocketeers and we are working on commercial model rockets,” says Poddar. On the regulation part, Poddar says Rocketeers just decided to go ahead and commercialise. As per the current regulations, there is nothing that prevents flying, but there are no restrictions, which is not very conducive to an ecosystem. Zero regulations might mean a near-complete extreme clampdown any time. Poddar had his first meeting with the Department of Industrial Policy & Promotion (DIPP), the authority who would regulate this, in January 2017. The meeting was facilitated through Invest India, and was followed by 21 more meetings with different branches of the government, including the Ministry of Commerce. “We had 16 with DIPP, four with the department of explosives, and two at the political level, but to no avail,” Poddar says. Poddar and his team even consulted with lawyers and came up with draft proposals for regulations. They consulted with Anirudh Rastogi, founder of the law firm Ikigai Law, and came up with legal proposals to present to different members of the ministry. But Poddar doesn’t blame the government too much for the lax attitude. Model rocketry doesn’t get votes or have big social impact. Besides, start-ups aren’t held in the best regard by government officials, he says. In future, how regulations come about depend on where flying is allowed. The Department of Explosives is the only one that will ultimately deal with regulation, with little or no involvement from any other bodies like the Airports Authority of India or the Defence Research and Development Organisation. There are quite a few model rocket-makers in India, with at least 14 groups/companies who are direct competitors to Rocketeers, who are attempting to commercialise their product. Some of them procure Diwali rockets, remove the “black powder lifting charge” or the fuel from it, and then fit it inside model rockets made of paper or cardboard. This is called the Typhoon Rocket and is how model rocket-makers typically start off. But such methods are not reliable when it comes to mass production for commercial purposes. “To make a reliable product, you need to do R&D on it. And for that, you need manufacturing units. Which brings you straight back to regulations,” explains Poddar. Before commercialisation and manufacturing, the design of the product is important. It needs to be reliable and commercially viable, says Poddar. And that requires market research and tenacity to stay in the scene for several years, listening to consumer demands and building prototype after prototype. “We found a vendor who was willing to make fuel cartridge casings for us. When I went to him for the first time and explained our product to him, his first question was ‘how much quantity?’ I said maybe a 1,000 pieces. He laughed in my face and asked me to get out,” Poddar recalls. A black powder manufacturing unit, even a small one at a firework factory for example, makes 2.5 lakh cartridges per month. Needless to say, machinery is not allowed — everything is handmade, and this is just the smallest unit. Bigger units tend to create 17 to 18 lakh catridges. And this is the scale that model rocket fuel will need to operate on because such factories are the only places the fuel can be produced. For their own rockets, Poddar and Ekka just employed the brute force version of getting factories to help produce their requirements. After they convinced the initial retailer, they approached to let them make fuel cartridges, they were told clearly that the factory doesn’t have labour for it. Poddar ended up working at the factory creating the cartridges by hand, working from 8am to 9pm for months. Ekka ended up staying inside the factory for days, sleeping there. Other companies and even individual rocket enthusiasts have tried other forms of fuel like paraffin wax. However, nothing so far has been scalable or commercially viable. Solving this technical requirement of having fuel is what enabled Rocketeers to solve the problem of commercialisation even without making any headway on the regulations side. To manufacture model rocket fuel even at the smallest of scales of about 2,000 cartridges, companies need their own manufacturing systems. And for a company to produce its own fuel, Poddar reckons it needs at least six acres of land. There’s massive funding required. And no model rocketry company, including Rocketeers, has been funded as of yet. Poddar claims investors have said they are aware this might be a big market, but investment is risky because they can’t gauge just how big. Plus, there is no standard for the model rocket product. Each group or company that teaches model rocketry (as none of the others have commercialised yet) has its own standards. Now that Rocketeers has broken into the commercial market, is Poddar worried that competition might use its methods and resources? The only thing Rocketeers wants is the ability to produce fuel cartridges, he clarifies. Nothing else is a secret. After all, for years, it has taught students to make their own model rockets in workshops. Poddar emphasises that his company wants as many stakeholders on the table as possible, in a flourishing ecosystem. Rocketeers’ goal is to work with outreach organisations, like the Society for Space Education Research and Development, to make model rocketry more accessible to youngsters across the country. Rocketeers has also put forth several proposals to ISRO to enable this ecosystem, hoping for support, considering both Poddar and Ekka are alumni of the ISRO-affiliated IIST. This article has been updated to correct some factual errors related to Rocketeers.